The Columbus Blue Jackets open up their preseason tonight at home against the Pittsburgh Penguins. Surely you’ll want to watch this exciting rivalry begin to reach new heights now that they both belong to the Metropolitan Division. The game is scheduled to air at 6 PM on the NHL Network. As a partial introduction to the Eastern Conference and as a partial preview for the fans in Columbus, I have decided to outline some of the things to watch for with the Columbus Blue Jackets in the preseason, which begins tonight. I have barely talked about Marian Gaborik over the offseason, however he is entering the last year of his contract. The Blue Jackets General Manager, Jarmo Kekalainen, said that he was not interested in negotiating a contract extension over the offseason. Gaborik will have to prove he wants a new contract, and his current salary cap hit is $7.5M which means he will have to have a great season to keep making that kind of money. Gaborik is one of the fastest skaters in the league and he has had several 40 goal seasons. His goal-scoring ability is something the Jackets really need this year. The good news, he is reportedly healthy coming into training camp. If he can stay healthy he should have no problem leading this team in scoring and (hopefully) being rewarded with a contract extension. Gaborik celebrating his game winning goal in his debut with the Blue Jackets last season. A player I am hoping to see develop and have a breakout year is center Ryan Johansen. The 21 year-old was drafted 4th overall by the Jackets in 2010. He’s spent two seasons at the Pro level and has had promising results. At the age of 19 Johansen was given an opportunity in the NHL and has held his own. Alongside a superstar like Marian Gaborik, or Nathan Horton later in the season, Johansen could potentially find his stride and unlock the elite-level of talent that is inside of him. The Pittsburgh native, R.J. Umberger upset fans at the beginning of last year’s season. He spent his time during the lockout volunteering with the Ohio State Buckeyes hockey team as an Assistant Coach, where he used to play. It became apparent that Umberger had not spent enough time training during the lockout and was a liability during the first half of the season. His play did eventually pick back up. Umberger is a crucial part of this team’s success. He’s one of this team’s leaders and needs to be effective for the Blue Jackets to make their push to the playoffs this season. Defensemen Tim Erixon, Ryan Murray and Dalton Prout are all expected to get ice time at the NHL level this season. Prout was the standout rookie defenseman for the Blue Jackets last season. He earned a plus-15 rating in 28 games with the Blue Jackets which led the team and was 2nd among rookie defenseman. He’s currently recovering from abdominal surgery but should be healthy before the regular season gets underway. 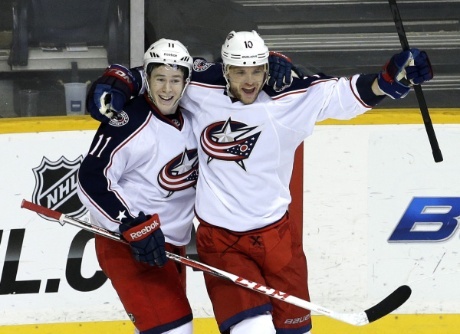 Tim Erixon and Ryan Murray will need to earn their spots on the Blue Jackets roster. Erixon was traded to Columbus from the New York Rangers in the Rick Nash deal. He played 31 games with Columbus in 2013 and had a decent season. Ryan Murray is expected to be the next superstar in Columbus. He was drafted 2nd overall by Jackets in 2012. While playing in the CHL during the lockout, Murray suffered a season ending shoulder injury. He’s made a full recovery and spent the summer in Columbus training for the new season. Columbus only has 4 veteran defensemen, Nikita Nikitin, Jack Johnson, James Wisniewski and Fedor Tyutin on the payroll. Cap space was an issue and they couldn’t re-sign Adrian Aucoin. It will be up to the younger guys to step up and fill the last two spots. Sergei Bobrovsky has an amazing work ethic and has put up solid numbers every year since he came into the NHL. I’m not going to jinx anything by talking about how VERY, VERY important it is to the Blue Jackets that he continues to improve and dominate the goaltending position. Finally, coach Todd Richards, selected as an Assistant Coach for the USA Olympic hockey team under Dan Bylsma, has to keep doing whatever it was that let the Jackets catch fire during the second half of last season. The team improved, by season’s end, in almost every advanced statistical category. Accomplishing what he did with the Jackets roster last season was very impressive and this season he has been given more weapons to work with. Once line configurations are worked out the team should be able to find some chemistry and establish themselves in their new Conference. They have great depth to work with and a new management team led by John Davidson. It really should be evident to the Eastern Conference teams that Columbus is a team to be taken very seriously. They played with a lot of heart last season. Flashiness is something they lack but sheer determination and the ability to wear their opponents down from game to game is something to be reckoned with, hence the Bruins reference that all of the fans are determined to get across. It truly is an exciting time to be a fan of the Columbus Blue Jackets.